The SPE range of Powered Hand Mixers are designed to accomodate both light and heavy duty applications. 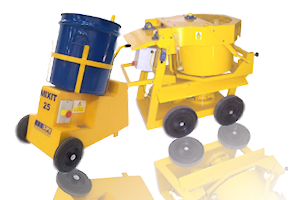 With a high torque single speed drive with electronic speed control for a soft start, the R1000 is a light and handy machine designed for the mixing of a wide range of materials and comes supplied with a WK120 M14 mixing paddle. For heavier duty applications, the New CX40 and R1300 models come with a high torque 2 speed drive and are supplied with an MK 140 M14 mixing paddle. All powered hand mixers are designed with a saftey handle for effortless operation and protection against damage and are available in both 110v and 220v versions. Optional accessories include a mixing station and fixing clamps to increase ease of use and safety.